Hurricane Irma is gone and perhaps Hurricane Maria will be knocking on our door real soon. 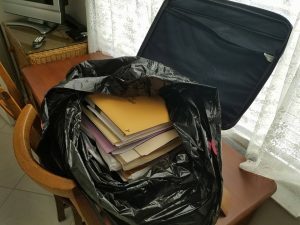 I need to share my experience as I am a caretaker of my Mom who is 94 years young. 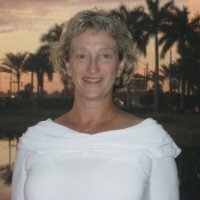 My Mom lives in an independent living facility in Delray Beach, less than 1 mile from my house. She is legally blind, bowel and bladder incontinent, and survived numerous bouts with cancer. Her kidneys function at around 30 percent. Her mind is still sharp. She is a tough Brooklyn girl from a poor family in Brighton Beach and worked until she was 74. 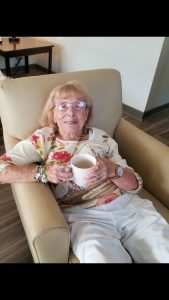 Her independent living facility did a wonderful job during the hurricane. Staff moved into the building with their families and kept the residents entertained. It was a very tough decision for me to say goodbye to my mom as the storm approached. I had to make the decision as to whether she would be safer in the facility with a generator or at my home 1 mile away without one. I chose the place with the generator not realizing how things would unfold. It is important to add that I brought my Mom a case of water, lanterns with batteries, and a battery operated fan. The facility did not deliver any water to the apartments. At a meeting before the storm, each resident was told to pack a bag in case they had to evacuate. Imagine, over 200 people over 90 years of age being able to pack a bag and all their medications. I dutifully did this for my Mom but wondered how the others would be able to do this. I serviced my bicycle so I could get around any downed trees to make sure she was safe after the storm. It is important to add that my mother is on Medicaid. She needs an aide to help her attend to the activities of daily living. Of course, the aide could not make it to care for her during or right after the storm. My mom was a trooper and with my help was able to get dressed, etc. The aftermath of the hurricane is where we must improve. My Mom and all the other seniors at her facility quickly started to experience dehydration and breathing problems after 48 hours in the sweltering 95 degree heat. I spent all Tuesday night texting any and all elected officials I could find on social media about the problem. Thank goodness a few were up also and listening to these kind of concerns. They assured me that they were trying to help get the power restored. Thank you Commissioners Steven Abrams and Mary Lou Berger and State Representative Lori Berman. On Wednesday morning, I knew my Mom would die if she had to remain in that heat another day. She was exhibiting signs of kidney failure and was having trouble breathing. I was fortunate to find a hotel room and came for her as soon as the curfew lifted on Wednesday morning at 6 a.m. 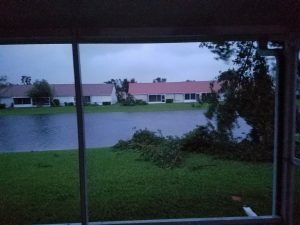 In addition, I called the Palm Beach County EOC at 6 a.m. I spoke to a woman who told me that she could not do anything about my concern for the elders. She shared that all she could do was answer my call. I began to cry and to beg her to find a supervisor or anyone who could help. I gave her the address of the facility. We both were crying on the phone about the situation as I begged for her help. Finally, power was restored at the facility at 11 a.m. I took my Mom to a hotel. Made sure she ate, drank a lot of fluids and had her cool down in the AC. When we arrived at the hotel, we turned on the TV. The story about the eight elders dying in Hollywood was breaking. I wondered if my Mom would have been one of them if I had not been up all night texting and calling everyone I could think of to make this facility a priority. The state requirements of a generator for some lights, one elevator, and food service is not enough. There must be a generator solely required to air condition a major room big enough where the residents can have some respite. There needs to be more elevators to take the elders to the safe space. Staff needs to be informed that they must be present during any power outage. Water must be provided in each apartment and in a safe room with AC. Flashlights and/or lanterns need to be distributed to each apartment. This equipment needs to be checked on a regular basis. Battery powered fans should also be provided and checked to be in working order. Shutters or impact windows need to be installed. This will cost money but these facilities must be made safe now. Furthermore, we need to improve Medicaid services after such a storm. I could not reach my Mom’s case worker as her voice mail was full for days after the storm. The parent company, Humana, did not set-up any way to speak to a representative. I left messages at the main office and at the corporate office in Lexington, Ky. Today — Monday — I finally reached a person in Tampa and was assured that I could be connected to the “Resolution Team” to help me with the aide situation. The “Resolution Team” was not there to answer the phone and another message was left for them to call me back. As I am writing this, I am still waiting for that call. Our elected officials have a great deal of work to do to ensure that our elders do not suffer this kind of fate. Each one of us will soon be that 90 year old sitting in a facility. I implore Gov. Rick Scott and all elected officials to set the tone that appropriate regulations be passed quickly to protect an extremely vulnerable population. The economy of Florida depends upon it.